Meet the new Émile Gillet cellos! They are professional quality cellos, but at a student level prices ($3,950 including the Bobelock cello case). The EG is only offered in a 4/4 size and comes with either a new Bobelock #2000 cello case or the new Tuff-Lite Traveler cello case. We're sure that once you play, see and hear the quality of these fine cellos, it will be the beginning of a long enduring relationship with your new cello. The prices, and information about the free Émile Gillet CD can be found in the middle of this page. We offer a very liberal trial period. You can ship out a cello and play it for a couple of weeks free trial. Take advantage of the special shipping! A copy of a famous Strad? 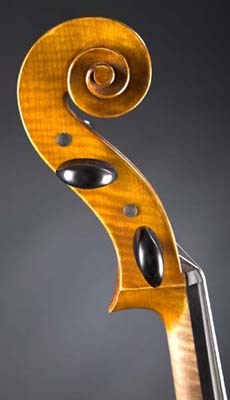 The Emile Gillet cello is modeled after the famous Gore-Booth Strad made by Antonio Stradivarious in 1710. And who was Gore-Booth? Many famous violins and cellos actually are named after either the first owner who many have also commissioned the instrument or after someone who owned the instrument at a later time (e.g., the "Paganini" violin or the Davidov cello now played by Yo-Yo Ma). The Gore-Booth was was named after the English amateur cellist Sir Robert Gore-Booth who owned the cello around 1853. The particular model was chosen because of its tonal qualities, form, outline and sheer beauty. (Even the stress marks and varnish wear has been copied.) All Gillet cellos are made from the best materials available in the world. The most important ingredient, the wood, is cut deep in northern China forests. The famous violin makers of history would no doubt marvel at these old-growth forests if they could see the beauty and quality of the instruments from these magnificent trees. The centuries-old tradition dictates, the top of the cello is carved out of aged spruce and the back and sides of maple. The fingerboards are made fromt he best ebony. 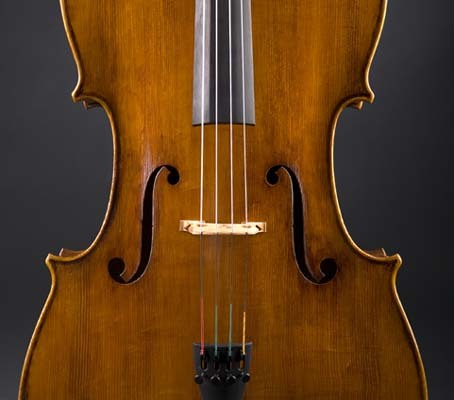 All the other major accompanying accessories, like the French maple bridges, endpins and cello strings, are specially imported from France and Germany as these countries are still the leaders in the finest accessories. Also, we have specialist websites for violin strings as well as a wonderful web site, simply dedicated to viola players and viola strings. All four sites, String Emporium, cello-strings, violin-strings and viola-strings, offer the best prices and the most quick and friendly service. Our North American distributor is the String Emporium, Email us, to become a dealer for Emile Gillet cellos. What makes the Emile Gillet cellos so special? They are created by hand with pride and hard work by fine craftsmen who practice the European tradition of cello and violin making, resulting in instruments that are respected throughout the world. Who buys these cellos. There is no typical customer. Young teenagers, that to need upgrade that "first" full size cello which they bought a couple years back, or even make the Gillet cello their first full sized one. The college student wanting a good cello with quality workmanship, beauty and sound. Even the most seasoned professional cellist, that wants a cello that will look, play and feel like their very valuable 'old' cello. (Some are a little shocked when the new Gillet plays even better than their 'tried and true' old friend.) The reason that we allow for the 2 week period is to completely take off any pressure of hurrying through the process: Players keep their instruments for whole lifetimes....why rush it? This also allows plenty of need time to warm up the instrument and show it teachers, friends and compare to other instruments that they might be considering (We're not worried about that either!) These cellos are the real deal. This is the first cello CD ever recorded with the full intention of showing off the instrument! We send the CD's out free to any cellist. We have just released a CD recording of world class Rumanian-American cellist, Jan Simiz with pianist, Larry Loeber which is recorded using the new Gillet Gore-Booth Strad. Email us if you would like to receive one these complimentary Cds. Please give us your name, address and phone number.